Saffron Road™, the packaged food brand of American Halal Co., will be launching the first frozen entrée of its kind nationally at the end of January. The new gourmet, frozen entrée, Chana Saag with Cumin Rice, is the first frozen entrée in the USA to be Non-GMO Verified. 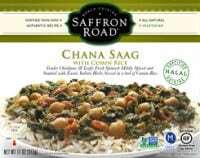 In addition to Saffron Road’s existing 12 World Cuisine frozen entrees (including four Indian varieties), the brand will launch a Chana Saag Entrée to appeal to the growing popularity of Indian cuisine in the US. Saffron Road’s unique twist on Chana Saag includes tender, organic chickpeas and leafy fresh spinach mildly spiced and sautéed with exotic Indian herbs served in a bed of cumin rice. This entrée is verified Non-GMO, All Natural, Gluten Free, Vegetarian and Certified Halal. The new entrée will be available nationwide later this month at Whole Foods Market stores. “Earning the Non-GMO Verification for our products is a big priority for Saffron Road and a huge added value to passionate natural food consumers who are actively seeking out Non-GMO foods,” says Adnan Durrani, CEO of Saffron Road. “We were motivated to add another ethnic frozen entrée to our portfolio as consumers continue to ask for more vegetarian and non-GMO options,and continue to look for more gaps to fill in the marketplace. Look for Saffron Road to produce even more innovative products throughout 2013,” ” said Jack Acree, EVP of Sales of Marketing.